Can you be so close to your business that you fail to see when your own industry is in decline? Over lunch recently, the subject turned to declining industries – a problem for many business leaders who are forced to watch their once-thriving businesses slowly erode as customers and technologies change and move on. Historically, we can easily name companies like this. Digital imaging has mostly killed Kodak. MP3s killed record stores and those who sold CDs. The airplane mostly killed train travel. e-books are killing bookstores. Email and texting is killing the post office. On and on. So what if you are one of those slowly being left behind? How do you accept or make sense of this erosion when it seems like there are still companies doing quite well in your field? Perhaps the first step is to step back and look at how industries perform amidst decline. First, let's diagram a typical industry to see a few things more easily. Here's a very simple model we created. I drew my friend a diagram. We call this the Enactix™ Performance Pyramid™. It very simply represents all the businesses in a particular industry today, I explained. Next I divided the Pyramid horizontally into three parts and numbered each part. The first tier (1) at the top are the market leaders, I said. This is usually a small group of companies who are consistently profitable, who have figured out the industry, how to market, and how to make money in it. They tend to be the most efficient and advanced companies with the best management. These are the ones that everybody pays attention to, the ones that articles are written about, and they are the companies who will survive longest – and perhaps evolve into something new with a better future when the industry and demand for it start to wane. The middle group (2) tends to be the moderate performers who have figured out several aspects of the industry, who know how to make money in good times, tend to lose some in bad times, and yet they aspire to be one of the top players. These are often the early targets for acquisition by bigger companies who are thriving and have cash, but they are usually acquired more for their ability to contribute top line revenue and have the potential to contribute bottom line profits after some work. Acquiring companies tend to keep their own systems and management in place when acquiring companies in this group. The bottom group (3) includes the weakest performers. These companies are the least profitable, the least competitive, and the least able to respond to changing conditions. Most aren't strong at driving their business through marketing, sales, innovation, or relationship building – what we call strategic control. As a result, they tend be affected first by any negatives that come along. They move into the red first when the strategic landscape turns down. As a result, they are generally the least attractive to savvy acquiring companies because while they may have assets in equipment, facilities, and even infrastructure, they also tend to be weakest in management and staff ability, systems, processes, and so on. Interestingly, I told my friend, the players in the lower two tiers tend to pay attention less to their strategic landscape and look upwards and think, "Hey, they're making money, I can make money, too." Except there are some important differences. The two lower tier companies (2,3) also tend to watch the market leaders and don't realize how much distance there is between the leaders and them. This bottom group (3) is typically among the last to be acquired because other than physical assets, the acquiring company gets little extra value and often has many things to fix to bring the company up to the new parent's operating standards. This simple three-tiered Performance Pyramid model applies to a great many industries. Adjust a few things – such as technology or innovation or market needs – and it works almost anywhere. And of course, you can always make it more complicated to suit yourself, but we generally avoid doing so. But how does this model apply to industry decline? 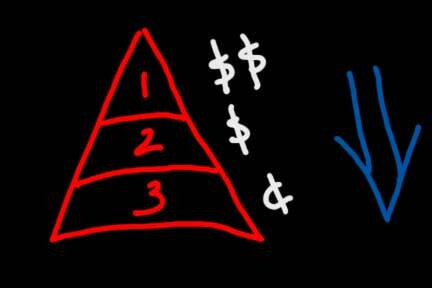 The lower down the Pyramid you move, the less aware leadership tends to be of what's happening in the marketplace. Trends. Changes. Competitors. New technologies. Global threats and challenges. Management tends to assume that things are pretty much as they were – or that they will come back. And that is a very real trap. A weak company is slower to recover when things improve. Any losses affect it more deeply. It may even wipe out the company's ability to ever recover. Add to these weaknesses a failure to pay attention and you have a candidate for a lower-value acquisition or even liquidation. First, identify some of the leading observers in the industry and ask or engage them to brief you on the trends and changes they see occurring – and their view of the future for your industry. Second, you may want to ask those industry experts to look at your company and give you their observations. Third, take what you learned and see if it matches up with what you've experienced. If there are patterns of decline, take it seriously. Last, very objectively map out what strategic options you have and move forward proactively. Which tier of the Pyramid do you think you are you in right now and why? Would outsiders agree with you? If not, why not? What are you doing to proactively watch for signs of change and market decline around you? If you saw signs of decline, how would you respond? Do you know what to do? Are you able to be objective about your company or your competitors... or would it help to have some objective outsiders to assist? Could you apply the Performance Pyramid to other areas, such as ranking competitors or evaluating potential acquisitions?